I woke up today to a rainy morning and clouds, but a few hours later all that turned to a beautiful, sunny day. Seeing the sun and first spring flowers blooming out there I was so inspired to bake something light and springy. 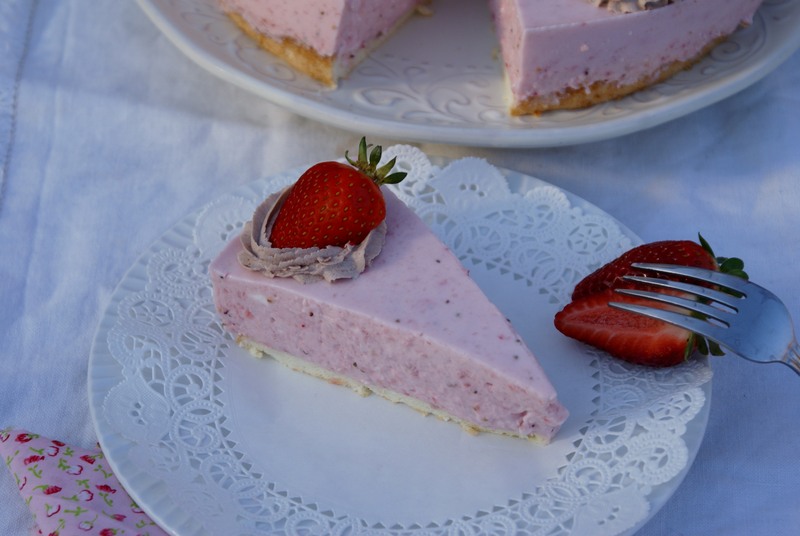 This Strawberry Yogurt Cake came right to my mind. These kind of yogurt and cream based cakes are often made in Germany. If any cake can be called light, then this is it (despite the cream 🙂 ). There is no butter and I excluded egg yolks! There is plenty of yogurt which makes it very refreshing and then strawberries to make the whole experience complete. It’s almost as if a smoothie was transformed into a cake. I LOVE IT, I hope you will too! Add smidgen of salt into egg whites and beat them until fluffy, add sugar and beat few minutes more. Combine flour and baking powder, fold into egg white mixture by hand. Preheat oven to 365 F (185 C). Line the spring form with parchment paper and pour the cake batter in. Bake for about 10-15 minutes or until tooth pick inserted in the cake comes out clean. Cool completely. Remove the parchment paper from the bottom of the cake and return the cake to the form. 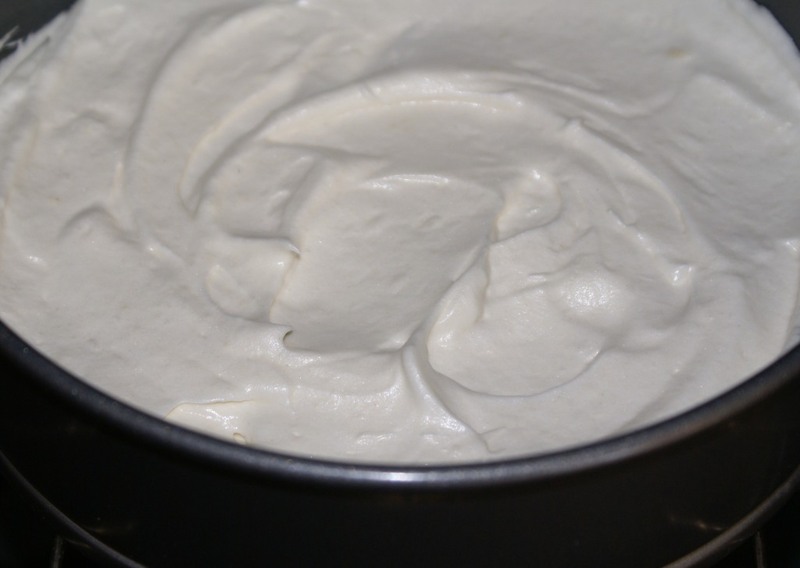 For the filling whip the cream until dense, add sugar and whip for one more minute. Cover and refrigerate. In another bowl add yogurt, lemon zest and sugar and mix by hand until smooth. Set aside. Put 4 tbsp cold water in a small cooking pot, empty contents of 2 gelatin envelops into it, mix it so there is no crumbs. Set aside for about 5 minutes. 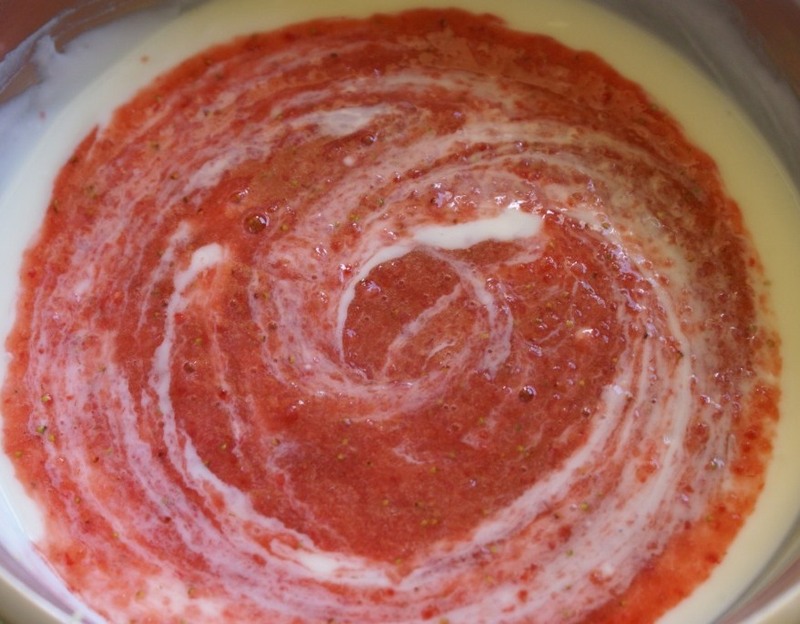 Wash strawberries, remove stems, put into blender and blend until liquid. 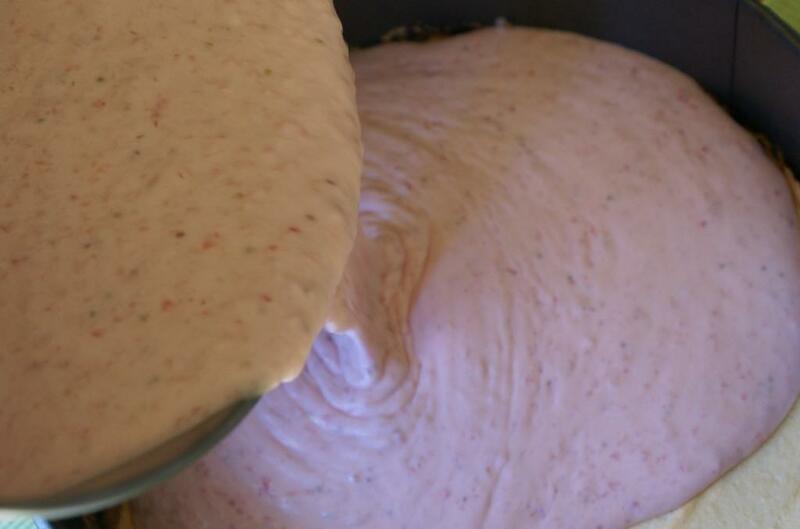 Add strawberries into yogurt mixture. Place the cooking pot with gelatin on the stove and lightly heat it, only until dissolved, do not let it boil! Add to it about ½ cup yogurt mixture and mix well. 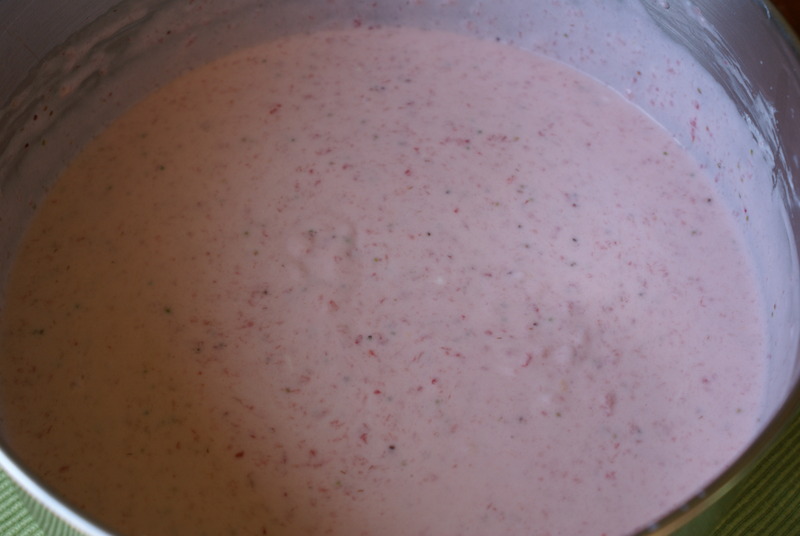 Now pour the gelatin mixture into remaining yogurt mixture, add whipped cream and again mix by hand until it all blends and looks like a strawberry smoothie. Pour the filling into the spring form and on the top of the cake. Filling will be liquid and that is ok.
Refrigerate for 3 hours minimum or best over night. After that filling will become dense (like jello). 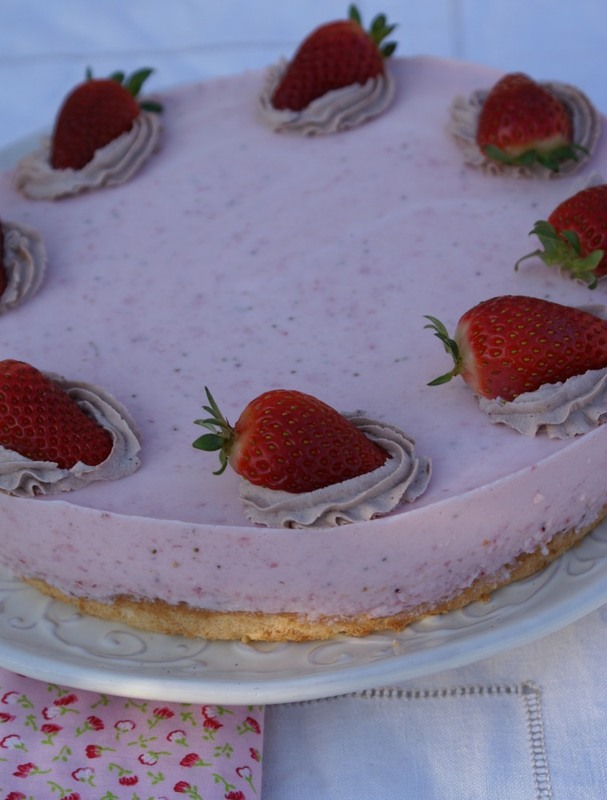 Remove spring form ring, decorate the cake with whipped cream and strawberries. Next > Ha! Kreativ Blogger Award! Your cake is beautiful and certainly looks like spring. Thank you for sharing a delicious and light sounding recipe. This is so pretty. 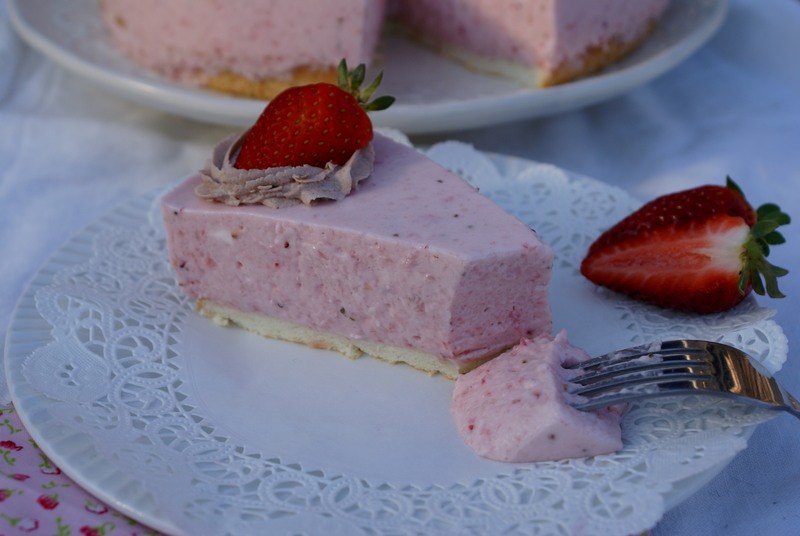 I can’t wait for strawberries to come in to season over here so that I can make this! Thanks! 🙂 I am sure you could make it with other kinds of fruit too. So far I made it with blueberries and strawberries, but would love to try with some different fruit too. What a pretty cake.. it looks like the sort of cake that would be served at a special Spring Tea or Mother’s Day Tea.. perfect!! Is that one on your blog?? It sounds very pretty!! It’s not on my blog. I made it in the summer and started the blog in September… Next time I make it I will make sure to post it here! 🙂 Have a joyous day! What a lovely summer cake. I like it because you could interchange berries for a different effect. What perfect timing! I was looking for a light cake recipe because I am trying to loose some unwanted padding but be able to bake. Hee. I am going to try this coming weekend or soon. Thanks for posting this. Great! 🙂 Compared to others, this cake really is so much lighter in taste and in calories I am sure! Thanks for stopping by! What a lovely looking cake, it looks so light and delicate and perfect for the coming warmer months. Beautiful! I can’t wait to try it 🙂 Thanks for sharing! I’m just waiting for my relatives visit me next month…..for sure I’ll let you to know! Thanks for liking my post and givi g me a chance to see yours! Your cake is beautiful, you are an artist! I’m not a baker, but I love this cake so much I have to try it! I think I can make it gluten free as well, thanks again Bella! hummm… I have to try it one day! Thank you Sibella! 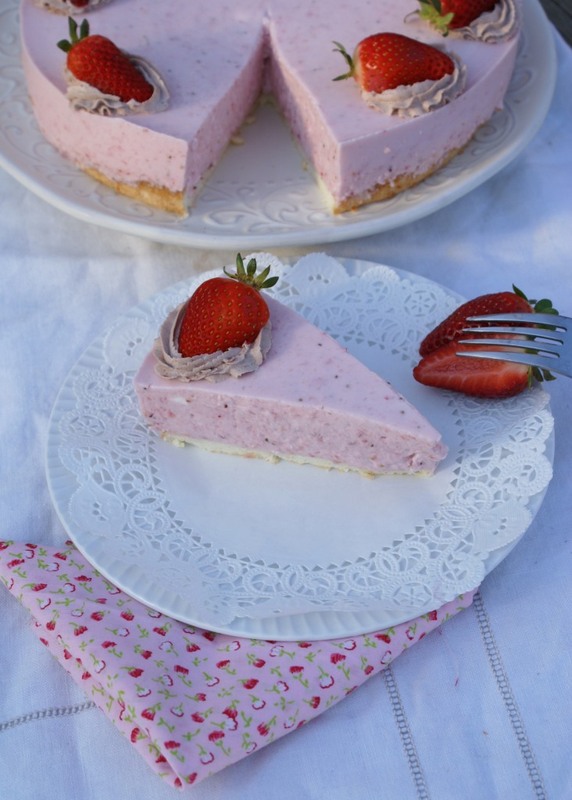 I have been looking for the perfect strawberry yoghurt cake for a long time. I will look no longer. I made it and we loved it. Thank you again for sharing this wonderful recipe. Oh, I am so glad that you liked this recipe. It is really refreshing and light and my family loves it too! 🙂 Thanks for visiting!